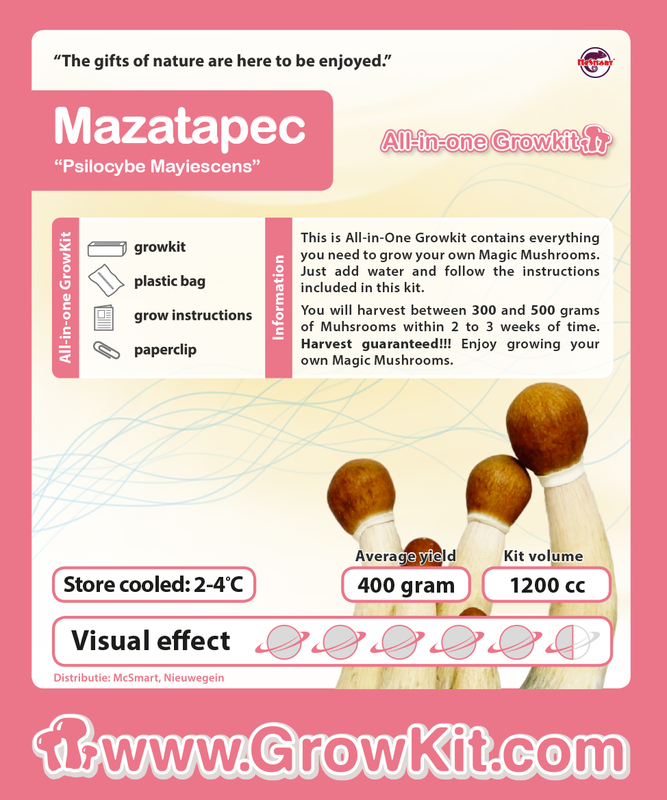 The Mazatapec is a Mexican mushroom. For those who enjoy a spiritual trip, this is a mushroom for you! It delivers a tremendous spiritual and visual journey. The All-in-one grow kit contains everything you need to grow your own. Magic Mushrooms This allows you to grow the old familiar quality of McSmart. Just add water and follow the instructions. The All-in-one grow kit contains the grow kit, a grow bag with air filters and two paper clips. The grow kit is available in 1200cc and 2100cc. With the 1200cc you grow on average a total of 500 grams and having the 2100cc, this about 1000 grams. On average there are three flights possible per Growkit. The first flight usually provides the biggest yield. When cooled you can store the kit about 6 months. Outside the refrigerator the kit has a limited shelf life. Enjoy growing your own Magic Mushrooms!